Born in Pittsburgh, Pennsylvania on April 18 1911. Allen Kerr was a bright student and graduated from the University of Pittsburgh in 1929 with a University Degree in Business. After University Allen became an organiser for the Civilian Conservation Corps (CCC), a civilian relief programme and part of Roosevelt's, New Deal. Following this he joined the US Army. In 1943 he underwent officer training at the Air Force Command and General Staff School at Fort Leavenworth in Kansas. From 1946 to 1949 he was comptroller of the allied forces in Nuremburg, Germany. After leaving Germany he attended the Georgetown University Graduate School for special courses in International Relations and in 1953 he was transferred to Fort Bragg, North Carolina, where he became the first director of the new Psychological Warfare School. His last posting was to Korea as Military Advisor top the Korean Army. He left the army in 1958 with the rank of Lieutenant Colonel. Following military service Allen went back to school, this time to study for a Masters degree in Advanced International Studies from John Hopkins University, Baltimore, Maryland, which he completed in June 1960. He next became a linguistics expert working in US Embassies in both Thailand and Laos until finishing his career as a Computer Services Consultant for the Government of Vietnam. Due to his work experience it is no surprise that his philatelic interests lay in Asia. Allen Kerr wrote articles for a number of philatelic magazines. His main contribution so far as China collectors are concerned is that he was the first person to pull together and catalogue the huge number of local overprints that appeared in Manchuria following the end of the Japanese occupation in 1945. The result of this work culminated in the publication of his catalogue "The Local Overprinted Stamps of Manchuria 1945-7" published by J Millard Williams in 1970. The Local Overprinted Stamps of Manchuria 1945-7 appears in small four booklets and for the best part of fifty years it has been the bible for collectors of these stamps. Although these books first appeared in 1970 the groundwork was done in the early 50's. In Volume 21 No1 of the China Clipper which appeared in November 1955 Kerr produced what he described as a "provisional listing" containing 276 cities and towns, 530 sets with a total of 3,321 individual stamps. Over the following years he would refine this in Clipper articles adding new discoveries and corrections. 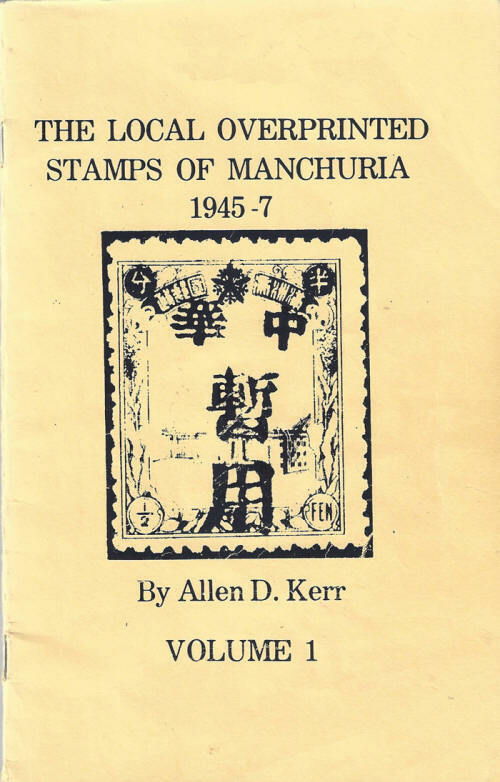 Fine though The Local Overprinted Stamps of Manchuria 1945-7 was, it is now known that this the work contains numerous errors and many overprints were missed. Shui-Hon Chan attempted a revision in his Volume II of the Stamp Catalogue of China but appears to have undertaken little research of his own, relying too heavily on Kerr's original work meaning that there is still much to be discovered. In addition to collecting stamps, his other hobbies included botany. He had a fine collection of orchids, succulents and euphorbia. An orchid named Kattleya Kerrii (Kerr's Kattleya) is named after him. He also had a keen interest in classical music and science fiction. Allen Donohoe Kerr died in Austin Texas of a heart attack on May 26, 1989. He was certainly one of the most notable China collector's of his era and we are all much indebted to his work.